Post-Martinů? 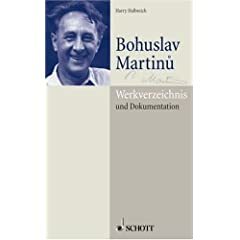 We don't even have a Martinů thread! Now we do! Thanks for the suggestion. Now everyone, please go out right now and get a recording of the Double Concerto for Two String Orchestras, Piano and Timpani. Of some half-dozen different recordings, so far I haven't heard a dud yet, so just pick one. I have his The Epic of Gilgamesh, does this excuse me from running out and buying another Martinu? - I can't find that tiny ° to put above his u, sorry! - OK, I take your word for your recommendation and shall check what amazon.com has in their store. Good idea! Martinu deserves a lot of attention ! The Double concerto is a magnificent composition. I have Charles Mackerras / Prague Radio SO (1982 rec.) on Supraphon. the very early (1918) Czech rhapsody, a big cantata for baritone, choir, organsolo & orchestra ( wonderfully sweeping & grand; hardly recognisable as mature Martinu - but lovers of Dvorak, Elgar, Smetana ( and with the help of some Bach & Händel...) should investigate!!). Kitice (Bouquet of flowers - 1937) - a cycle of songs on folk texts that deal with rather sinister themes ...(Uliana poisons her brother....,an old man meets death in a cornfield...etc) set for soli, choir, children's choir and small orchestra ,it bristles with catchy ,irresistable tunes that invite to sing along. great (mono) performance led by Ancerl. The miracle of our Lady - a cycle of 4 -rather short- operas. The Epic of Gilgamesh is very good, but you might find things in his output you like better. He's written quite a few operas (none of which seem to be on the Met's radar). And many of Peter's suggestions above I don't know at all...this is a composer with a huge output. PS, Lis, no worries about the kroužek (learned something today!) in Martinů's name (or other diacriticals, for that matter). But you know you can cut-and-paste, even from the subject line of this thread! this is a composer with a huge output. The Parables - orchestral late Martinu at its most glowing and sublime. Vigile - his last piece, a deeply moving nocturne-like work for organ. This sounds great, and I've heard Jennifer Koh several times live--she's fantastic. She did the Ligeti Violin Concerto here a couple of years ago. And Luke, I don't know that recording of the Fourth Symphony, which also sounds very enticing. I do have (at the moment) two different recordings of the Memorial to Lidice, including Christoph Eschenbach's with Philadelphia. PS, totally by chance, my mother happened to hear it last season with Osmo Vänskä and the Minnesota Orchestra and wrote saying "what a great piece it was." It's one of those very special readings - everything about it is radiant. I've met people - like the French marketseller from whom I bought the Safranek biography - who just start talking about it, and how it was the hook that drew them into Martinu years ago, as it did me. You can get it very cheap now, with its original coupling (Tre Ricercare). 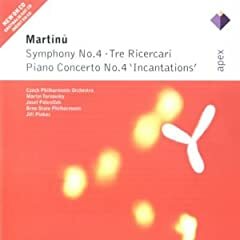 The PC recording on this disc comes from elsewhere, and I don't know it, though it is also, of course, one of Martinu's finest works. Excellent, thanks! And PS, I have not read the Safranek book, either--another for the "to read" list. I have a good version on Timpani (with Jacques Tchamkerten on ondes Martenot) - but this is the original...Sound is not perfect - Thereministe Carolina Eyck is! Verrry vigorous first and what many consider his masterpiece, the Double Concerto. I recommend everyone pick up this set right away, before it becomes much more expensive! The Parables and Estampes are showcases for M's shimmering orchestration. Hey, shouldn't this thread have a witty name like Maison du Martinů or Bohuslav's Beach house? Hmmm... ? Maison de Martinu ? Or "Bohemian dwelling"? Musicbox? Mountainlodge? I thank you for correcting my awful French. Pas de problème ! you are welcome. Couldn't agree more. The finest set of Martinu symphonies available! Trying to keep track of all of these is pretty difficult! The number of times I stood in a CD shop(in Prague, for example) trying to remember whether I already had a particular concerto...! Inevitably, Martinu's output is variable in quality. He passed through a number of stages- jazz influences in the 1920s, neo-classicism in the 1930s, neo-romanticism in the 1940s-1950s. There are certainly a number of masterpieces amongst his compositions. I have a great deal of time for the symphonies, the Double Concerto for Two String Orchestras, Piano and Timpani of 1938(mentioned above) is undoubtedly a superb, powerful and moving work, and the Parables and the Frescos of Piera della Francesca are both colourful and dramatic. The trouble might just be that because he wrote so much(and so quickly) Martinu is sometimes guilty of note-spinning repetition. Some of the works from the 1930s(in the neo-classical phase) are difficult-at times-to tell apart! Fortunately, Martinu has been pretty lucky in that, although his music does not often feature in live concert programmes(at least in Great Britain! ), most of his orchestral music at least is available on CD. Almost unbelievably, of all the concertos listed above only four are not currently available and two of those will be included in the new Hyperion series of the works for violin and orchestra. So-there is plenty to explore for the inquisitive! There was some Martinu played at the Barbican (London) a few years ago where I recall hearing the beautiful Frescoes of Piero della Francesca and other works. My favourites are: Symphony 4 (Turnovsky is the best), The Epic of Gilgamesh, Frescoes, Paraples (after St Exupery), Piano Concerto "Incantations" (on Turnovsky CD with Symph 4), Memorial to Lidice. Karel Ancerl was a great Martinu conductor. look out for his Supraphon Gold Edition CD with the Frescoes and Parables (with Janacek's Sinfonietta): a great disc. The Bryden Thomson box set of the symphonies on Chandos is as good a way as any to investigate this great composer. Few years ago I bought a Naxos CD of Martinu's works for cello and piano. I find the music unlistenable. Not my cup of tea. So, are you judging the composer entirely from one recording of the cello-&-piano works?